SIN CITY TATTOO SHOP - Best Tattoo Shop Prices in Las Vegas close to the Strip. Call for tattoo and piercing prices or book online. Best Las Vegas tattoo Shop Sin City Tattoo Close to the Strip. Get the best tattoo services and prices in Las vegas with Sin City Tattoo. Were located close to the Vegas Strip. Get up to date information on tattoo prices costs. Sin City Tattoo provides the Best value in Las Vegas for prices and service. ​Call today (702) 473-0552 to get a quote from one of our friendly staff. We provide a Low Tattoo Minimum for half dollar sized tattoos. Please fill out only one contact per person. Our typical response time is within 1hr to 24hrs. Using and Uber or Lyft? We will pick you up for your appointment and drop you off to your hotel, casino, motel or airport for less than they charge. Please ask about this service when you book online or inquire about pricing. We specialize in color tattoos and custom artwork. Sin City Tattoo is one of the Best Tattoo Shops in Las Vegas. View Sin City Tattoo's prices, and book your next tattoo or piercing online. Get $600 Tattoo Specials and take advantage of our ​$700 Tattoo pricing on Quarter sleeve tattoo ideas. We have $800 All you can endure specials for black and gray tattoo's Tuesday through Thursday. Looking for a $900 Color Tattoo Special for portrait tattoo's? We have $1,000 Tattoo Sessions that give you 2-3 days worth of tattooing while you're in Las Vegas. View Sin City Tattoo Prices and REVIEWS. 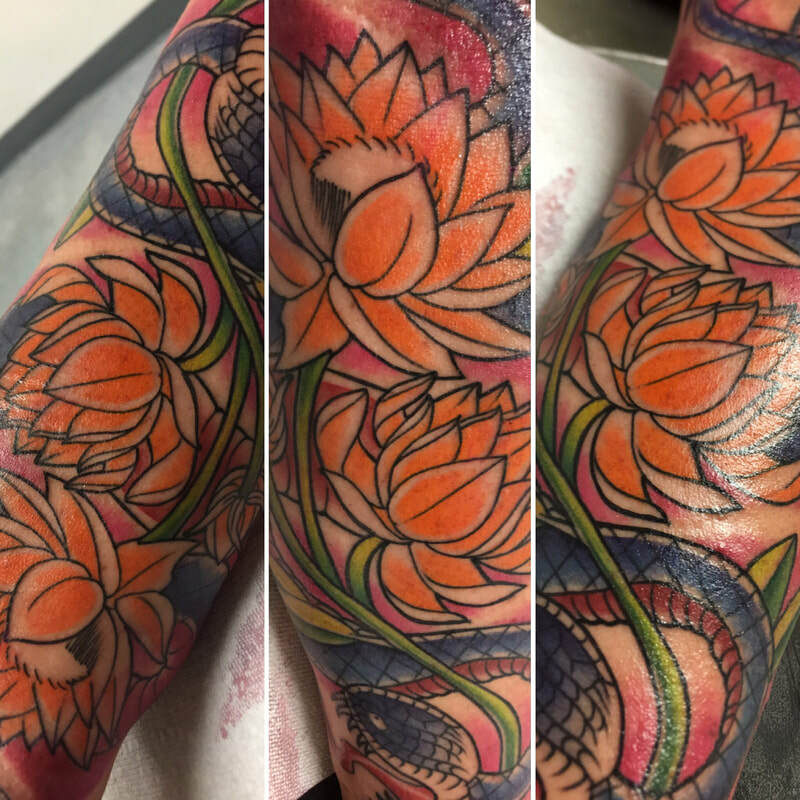 ​Allow Sin City Tattoo to give you tattoo shop prices that match the quality you need for your new watercolor tattoo or geometrical designed tattoo. Sin City Tattoo Provides world class service along with the Best tattoo prices off the Las Vegas Strip. Welcome to one of the funnest and positive tattoo shops your ever going to meet. 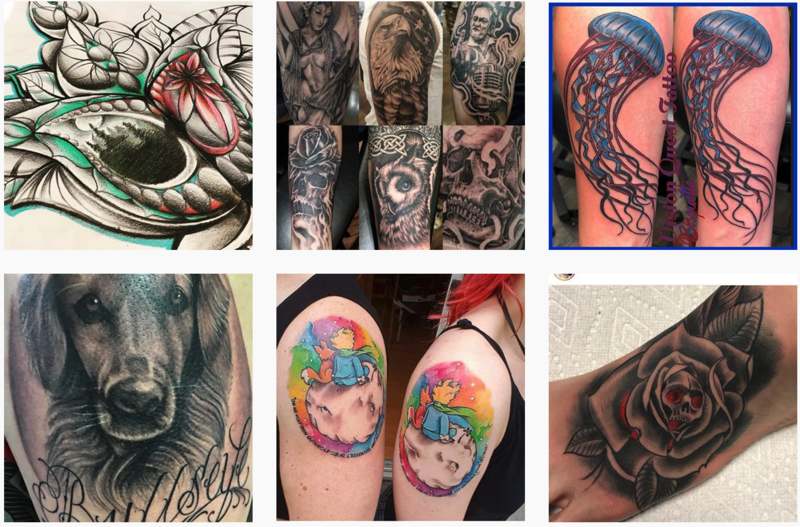 Sin City Tattoo is a team of good spirited and energy driven artists who love what they do! We cant wait to meet you. We specialize in Neo-Realism, traditional, color, color realism, black and gray, mandala, watercolor tattoos and so much more. Our piercings start at $20 and our tattoo minimum starts at $60. Please call us (702) 473-0552 and ask us about pricing. ​Book online and get a quote. Sin City Tattoo has been earning the communities trust since 2011. Our focus is about creating meaningful personal connections with every client we meet. ​Sin City Tattoo's artists are available to greet customers, address common questions and take messages. ​Over 90% of our customer interactions happen over the phone. We know that 70% of clients are likely to choose another tattoo business after a poor experience. Over 80% of callers say a great phone experience makes them a repeat customer. SIN CITY TATTOO is a LAS VEGAS Skin Design Tattoo Club all its own. Come enjoy the SIN CITY TATTOO Tatt Life in style with us and our diversity of tattoo artists in a Studio close to the Las Vegas strip. We will give you HONEST Pricing with Nevada State Certified Artists. SIN CITY TATTOO Has a Touch that is Global! I am a resident of Las Vegas and had been recommended by a friend to try this place out, I always feel at home there and the work is phenomenal. I've had 7 pieces done by them and they are all on point. If you're looking for the best, it's here. "SIN CITY TATTOO provides all clients in Las Vegas exceptional and unmatched Tattoo and piercing services with an array of 20 plus artists to choose from by any other Las Vegas Tattoo Shop"
"Other tattoo companies are great, but we hope to take care of the small tattoo needs as well as the LARGE ones!​" Call us after you call other Las Vegas Tattoo Shop. 's on the strip and you'll find our pricing, service, and our tattoos can't be beat. "The highly rated and most talked about tattoo shop is SIN CITY TATTOO. There is so much to like about this place. It is the best because of the passion and energy the artists put into their art. There are many specials to choose from and the credibility of the artists makes them really impressive. They offer watercolor tattoos which are a new kind of tattoo. The prices are very competitive and affordable for anyone. The precision of the artists is really special. A lot of the people that go here can't imagine going anywhere else. Sin City Tattoo honoring Tattoo minimums from Koolsville Tattoo for $10 showing patrons the value and education them on clean tattoos that have clean lines every-time. Most patrons decide on more complex designs as well as contrast to there tattoo's. 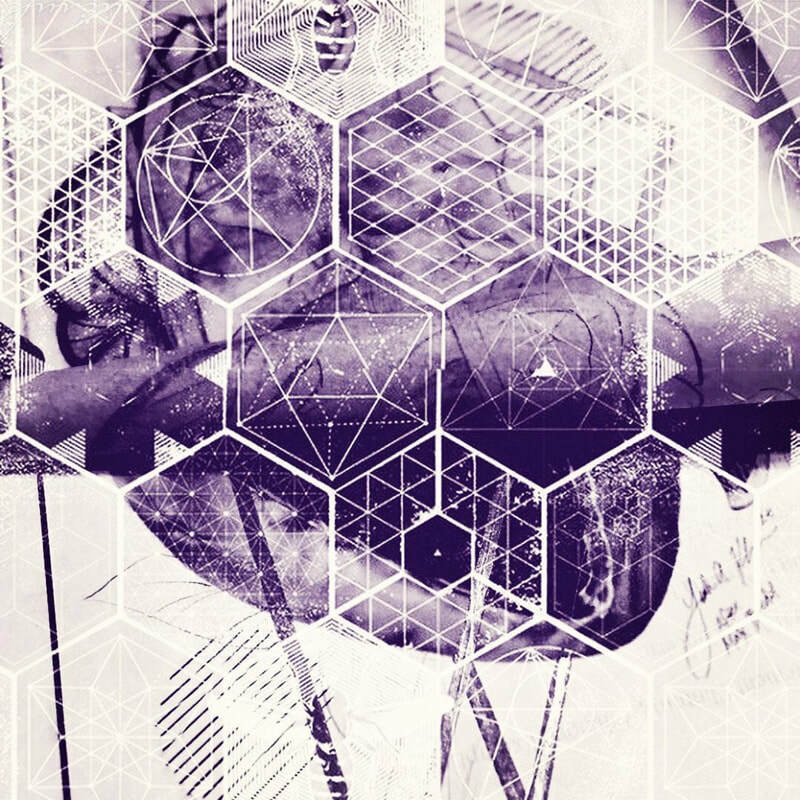 Allow the skin design masters to educate you on design elements that enhance your tattoos. We honor $20 tattoo minimums and can even beat most shop promotions. Sin City tattoo Shop honored TATTOO LV $30 Tattoo Minimum. Sin City Tattoo has one of the strongest tattoo followings over Las Vegas California, Utah, Idaho and Arizona. "Las Vegas is an adult playground like no other in the United States, if not the world. Not only do you have the what happens in Vegas stays in Vegas attitude, you can be inspired to go beyond your normal safe routine into something out of the box and dangerous like getting a tattoo from Sin City Tattoo." 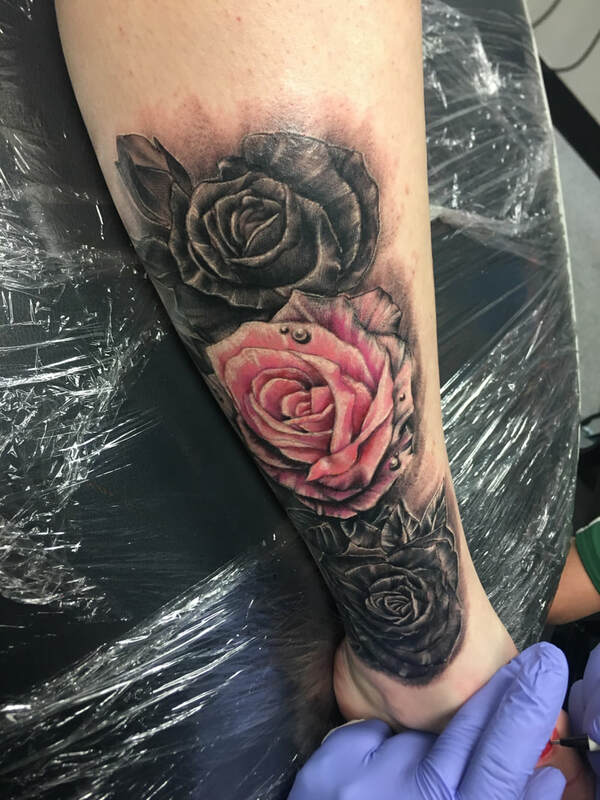 There are many tattoo shops in Vegas, but if you want one close to the strip that offers a mix of talented artists ready to create any design you imagine, then you must visit Sin City Ink. They are hand drawn according to customer requirements. Tattoos are inked with the precision of a surgeon performing their specialty. No matter the type of tattoo you want done in the style you choose, Ink Master tattoo artists can make it happen for you. There is no better place to visit in Las Vegas. Get inked by a pro at Sin City Tattoo Las Vegas! What happens in Vegas stays in Vegas — unless you honor the mayhem with a tattoo. Ink Masters features more than 15 top tattoo shop artists who specialize in old school tattoos, modern tattoos, permanent makeup and the newest technologies for skin art application. Along with traditional tattooing and body piercing, Ink Master is proud to now offer watercolor tattooing. This new tattoo technique decorates skin with vibrant colors while avoiding the heavy black outlines that characterize older tattooing methods. Because the colors can blend together, the art looks very much like watercolors on canvas. 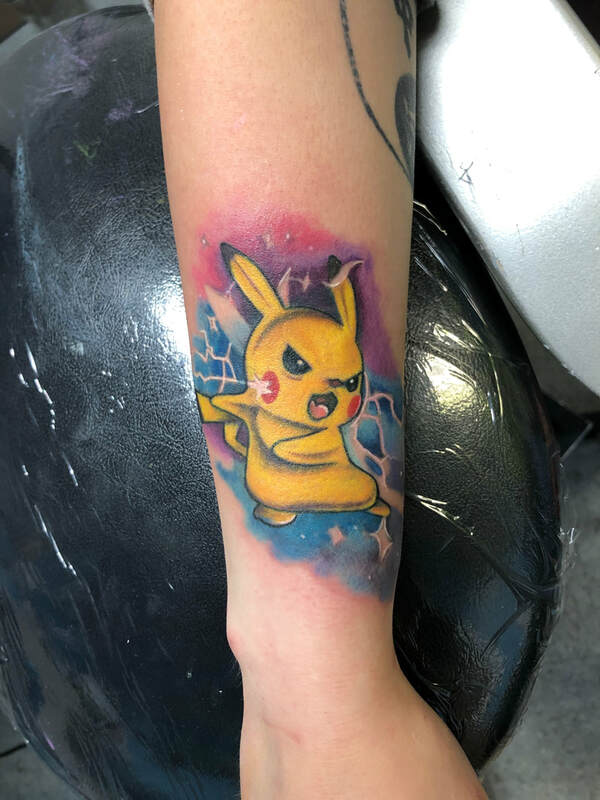 Tattoo shop artists at Ink Masters Las Vegas are trained to create watercolor tattoos that will remain clear and vibrant as the years flow by. Prefer black and gray tattoos? 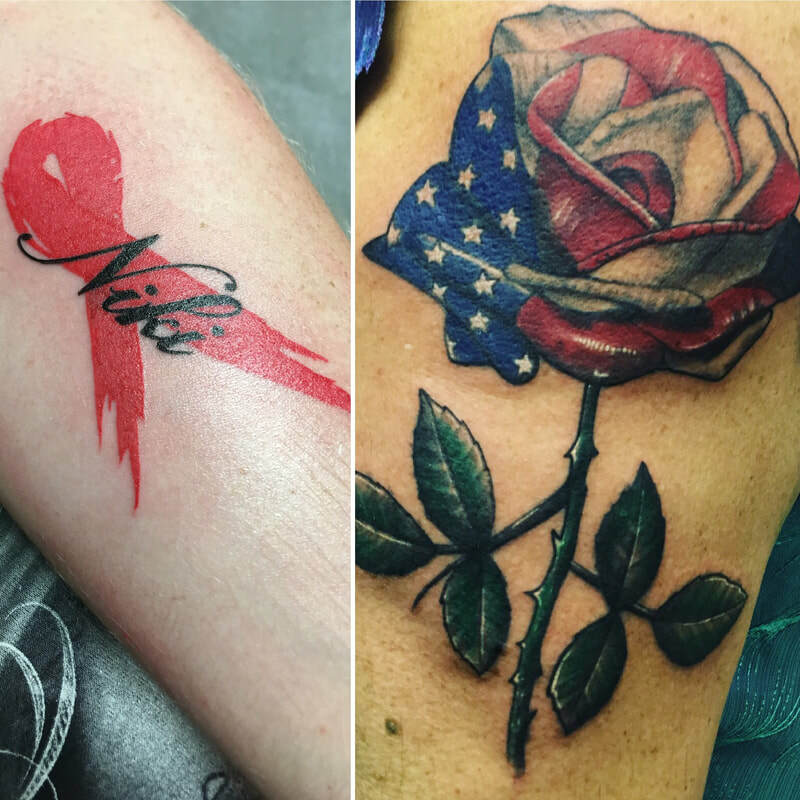 Money-saving promotions at Ink Masters include “All You Can Endure” specials. Book a six-hour or eight-hour appointment and get the job done quickly! SIN CITY TATTOO, Best of 2017 Las Vegas Tattoo Review! All you can endure specials, and so much more! This Las Vegas Tattoo Shop is Located near the strip for easy convenience. Allow SIN CITY TATTOO to help you develop your Tattoo pattern. We provide more specials than any other shop in the united states. SIN CITY TATTOO SHOP has been created for our tattoo and PIERCING enthusiasts who seek exceptional tattoo's and perfect service. Check out our Las Vegas Tattoo artists for anything you need. 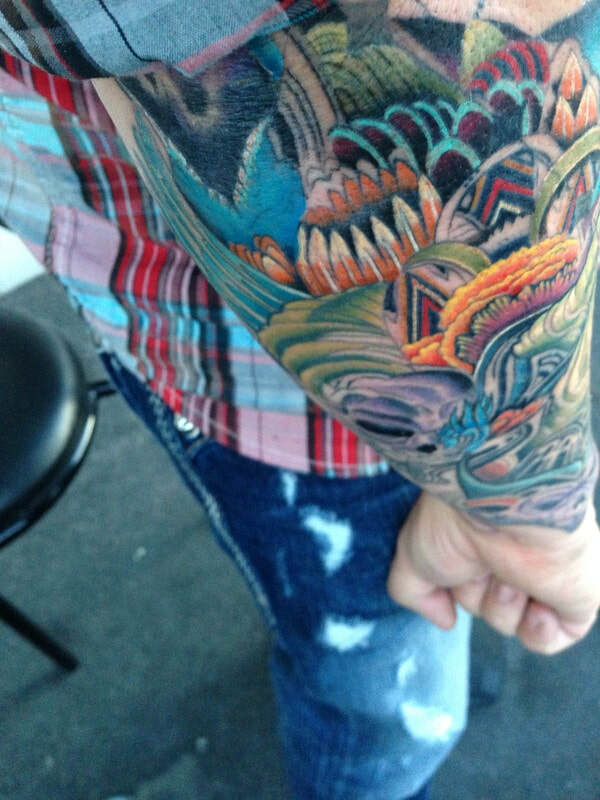 Ink masters in Las Vegas have artistic credibility that the whole world should see. SIN CITY TATTOO is known for a lot more than committing sins! In between shows and the tables, go to Ink Masters and check out their cool tattoos. The staff is friendly and the tattoo artists are the bomb. I think the prices are reasonable for their expertise. So, if you are in the Vegas area. You will always have a remembrance of your trip to Vegas that will last forever. 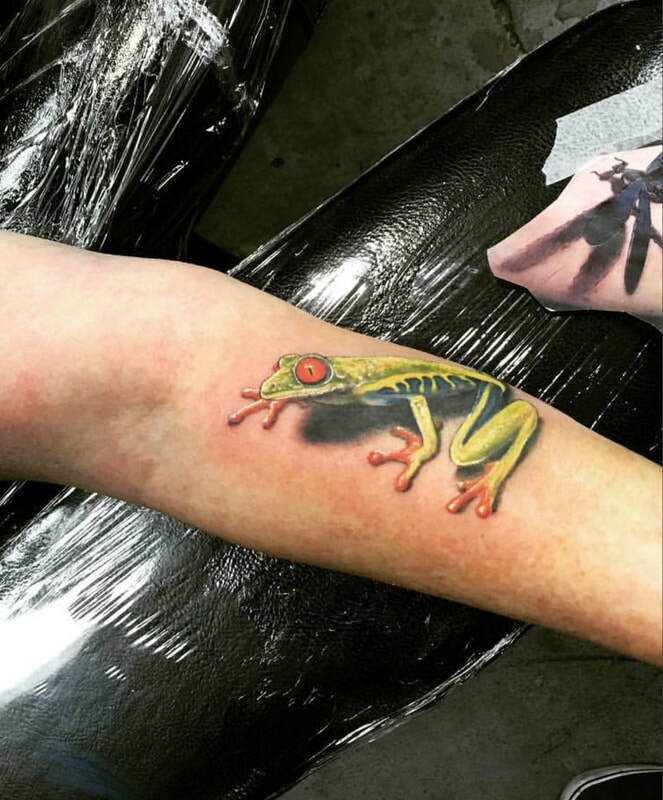 Sin City Tattoo in Las Vegas has your Flash Designs, Custom Artwork, Reviews, Top Tattoo company listings and more... You'll get information from leaders in our industry concerning tattoo after care, tattoo training, and tricks of the trade. Share your tattoos ideas and let us know what’s on your mind. If you want tattoos in Las Vegas look no further than here. Visit us for your body piercing needs. "View our listing on Best of Las Vegas Tattoo Review. Over 300 5 Star Reviews over the last two years! Know this before you go anywhere. Sin City Tattoo and Las Vegas Tattoo Lounge provide a diversified assortment of tattoo artists. This Las Vegas Tattoo Shop will provide the best tattoo pricing in the valley. Give Sin City Tattoo or Las Vegas Tattoo Lounge a call today for a price on your new tattoo or piercing. SIN CITY TATTOO Las Vegas gladly introduces a percentage of the baddest ink on the piece! 702 tattoo and puncturing shops that offer you stunningly competitive costs! In excess of twenty specialists accessible for the differing qualities in method you require. Get to know your tattoo craftsmen through a benevolent visit at one of our three restrictive areas including Las Vegas Tattoo Lounge and Executive Tattoo Lounge. Every craftsman is exceptional in their style so you are certain to discover somebody who is ensured to provide for you precisely what you need the way you need it! Regardless of what your skin color is, we have the fitting ink that will pop on anybody's body! Our stores additionally offer body piercings and lasting cosmetics at an entryway buster cost. Aftercare counsel and extras are all included in your arrangement. Look at our fabulous tattoo surveys to hear why our clients commend us, for yourself! The best shops on the strip are at your administration! Las Vegas Tattoo Shops - Tattoo Reviews, Prices, Casino Shops & Much More. Sin City Tattoo's Portrait Tattoo Shop, the most professional place that you will ever need in order to get tatted up. Our experienced artists have the skill to accomplish any type of portrait tattoo designs. Choose from a wide range of designs or you can show us your choice from different sources and we will make it happen, with us it is all about the quality, if you are looking for affordable prices but at the same time the highest possible quality work then we are what you are looking for without a doubt. Look no further and come get your very own piece of art tatted on your skin and make others envy you. Our artists have top notch precision in their work. $40 tattoo specials in las vegas. Sin City Tattoo can tattoo a partial quarter sleeve with full detail starting at $300. Cheap tattoo shops in las vegas will become a service nightmare. We provide $400 tattoo's incorperating Photo Realism as well as color realism to any area of your body. "Sin City Tattoo is an amazing place to get a tattoo with their expert tattooists and legendary customer service. They are open every day from 10AM to 11pm and you can book your tattoo now at www.mysincitytattoo.com. One of the most notable tattoo shops in Las Vegas. Don't forget to pick up this amazing tattoo souvenir before you leave and remember your trip for the rest of your life. Your skin can be the perfect canvas for their amazing artists and with their amazing talent, almost any image is possible to replicate onto your skin. 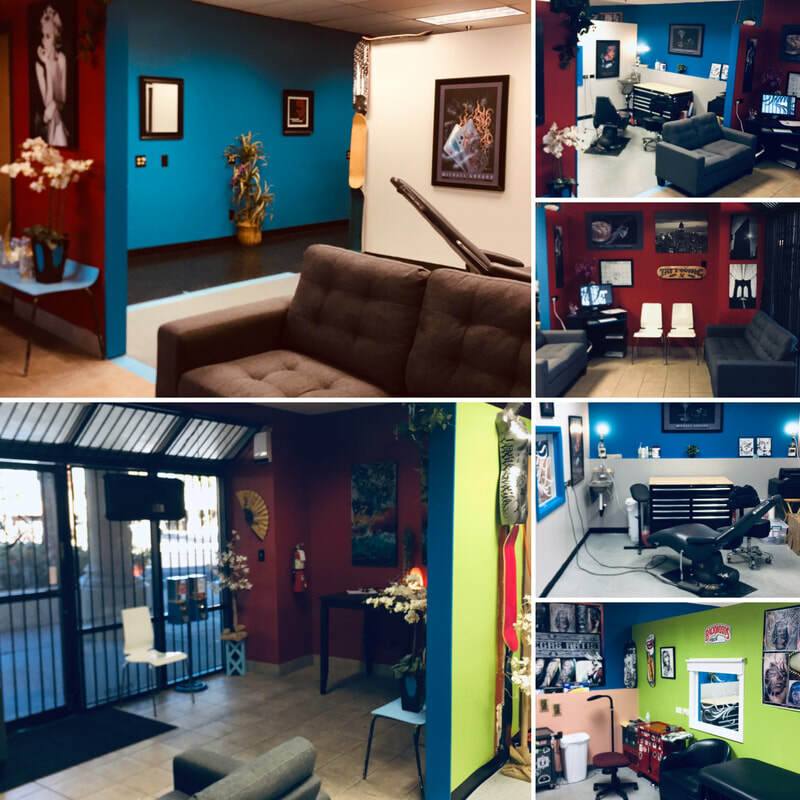 If you go ahead and read some reviews from previous customers, you will find that the employees at Sin City Ink are very laid back and extremely talented in their ways. 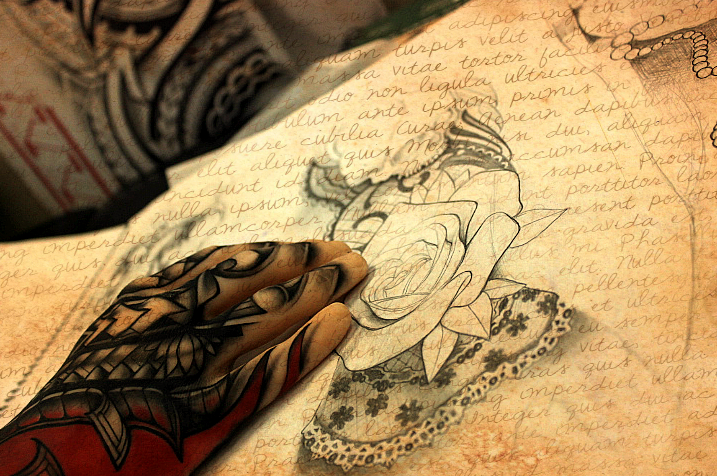 If preferred, you may even request a hand-drawn image of what you want tattooed. With over 20 artists, you are guaranteed to receive expert care upon arrival. Join the family and stop by today for your very first tattoo. They also offer piercings in many places, as well as perpetual makeup, and you can call them at (702) 473-0552 for any questions you may have. For any questions or to receive a free instant quote, visit their website and fill out the simple, hassle-free quote in less than 5 minutes. Not only do they have a gallery of completed work for you to view, there is also a list of special promotions on the website! Go ahead, and check out Sin City Tattoo. $1,500 Pays Half up your total Tattoo Apprenticeship Investment. Welcome to Sin City Tattoos Apprenticeship School. This will account for half your investment into your tattoo apprenticeship. Please save your printed receipt and bring it along with your state issued ID or Passport when we set your first apprenticeship appointment in person in Las Vegas NV. Your representative will be either Beau Woodward or Patty and we welcome you to the Sin City Tattoo family. $800Tattoo Apprenticeship Initial Investment.Welcome to Sin City Tattoo's Apprenticeship School. This will account for your initial investment into our tattoo program. Please save your printed receipt and bring it along with your state issued ID or Passport when we set your first apprenticeship appointment in person in Las Vegas NV. Your representative will be either Beau Woodward or Patty F. and we welcome you to the Sin City Tattoo family. $400 Initial Tattoo Apprenticeship Investment. Welcome to Sin City Tattoo Apprenticeship School. This will account for your initial investment into our tattoo program. Please save your printed receipt and bring it along with your state issued ID or Passport when we set your first apprenticeship appointment in person in Las Vegas NV. Your representative will be either Beau Woodward or Patty and we welcome you to the Sin City Tattoo family. This $200 is good for any one Tattoo, Piercing service with Sin City Tattoo and may also be used as a deposit towards your next appointment. ​You will receive an email confirmation for your purchase. This is your receipt. There is no refunds. Your credit will never expire. RULES: Valid for as long as were in business. This $50 is good for any one Tattoo, Piercing service at Sin City Tattoo in Las Vegas and may also be used as a deposit towards your next appointment. ​You will receive an email confirmation for your purchase. This is your receipt. There are no refunds. Your credit will never expire. KEEP EMAIL RECEIPT FOR PROOF OF PURCHASE. This isn't for the faint at heart! Bring your toothbrush, pillow, favorite DVD because your staying over with us. We have over 13 Tattoo/Piercing Artists to choose from. BUY NOW! RULES: Valid for 6 months from purchase date., Valid at all 3 Tattoo Lounge locations & Sin City Tattoo., Not valid with any other offer. Value if for black and gray work. Appointment must be set up in advance. Your session will be timed. Tattoo Artists breaks will NOT be counted. Only yours will, Only yours will. Don't Tap Out! Are you ready for Sin City Tattoo's Most Acclaimed Endurance Special? BUY NOW! 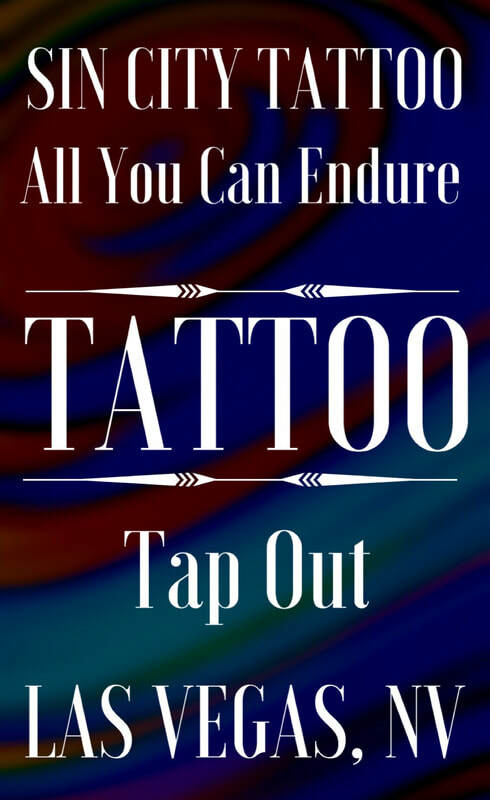 All you can endure Tattoo Tap Out Special. BUY NOW! ​This voucher not valid with any other offer. Value is for black and gray tattoo work only. Not to be used with any other promotion or deal. Purchased tattoo voucher Valid any day of the week by appointment only between the hours of 10am to 10pm. Your appointment must be set up in advance before you can begin your tattoo. Your session will be timed. Tattoo Artists breaks will NOT be counted, only yours will. Don't Tap Out and congratulations on your new skin art! This offer not valid in New Mexico, Puerto Rico or Kuala Lumpur.